Actually, we already have two parties that talk about education reform without worrying about offending unions. In fact, we've got one union, the AFT, which far from being offended, actually invites Bill Gates to be the keynote speaker at its convention. And the thanks it get for that is having its president vilified in a propaganda film lauded by Oprah, NBC's so-called Education Nation, and the usual suspects. However, the usual suspects now include the President of the United States, ostensibly a Democrat. So why do we need a third party to echo the anti-union, anti-teacher sentiments of the GOP and Democrats? 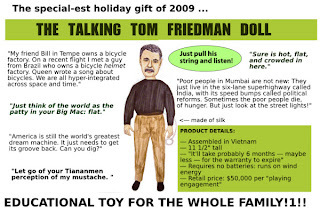 I guess you'd have to ask Tom Friedman, for whom doing the most cursory research is an inconvenience. That's a fundamental problem with journalists who already feel they know everything. 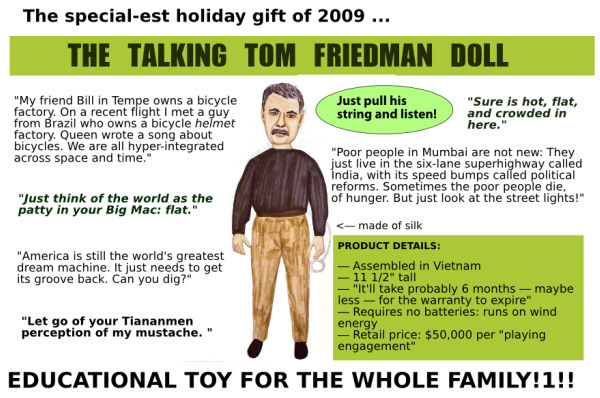 And regrettably, Friedman is representative of a trend. It's kind of galling to see scores of bumbling incompetent journalists not only making many times our salaries, but also having the audacity to preach about merit pay, charter schools, or whatever Bill Gates has on his mind this week. Don't expect to see a panel on Oprah addressing that issue anytime soon.